Are you ready to take your career to the next level and break into advanced markets? With few hours in a day, it can be tempting to trade traditional and individual life insurance business sales for more advanced markets, where the bottom line is often notably increased and the cases more intricate. Why would you spend the same amount of time for a less prosperous and sometimes more routine result? Well, one reason may be that advanced markets sound like more work, and often are, due to their complex nature. However, the reward of working with high-net worth individuals and business owners is not only financial, but also mentally stimulating. Another reason could be that breaking into advanced markets is a tough feat and can seem almost impossible with the competition of highly qualified advisors who have established reputations. These advisors had to start somewhere though. 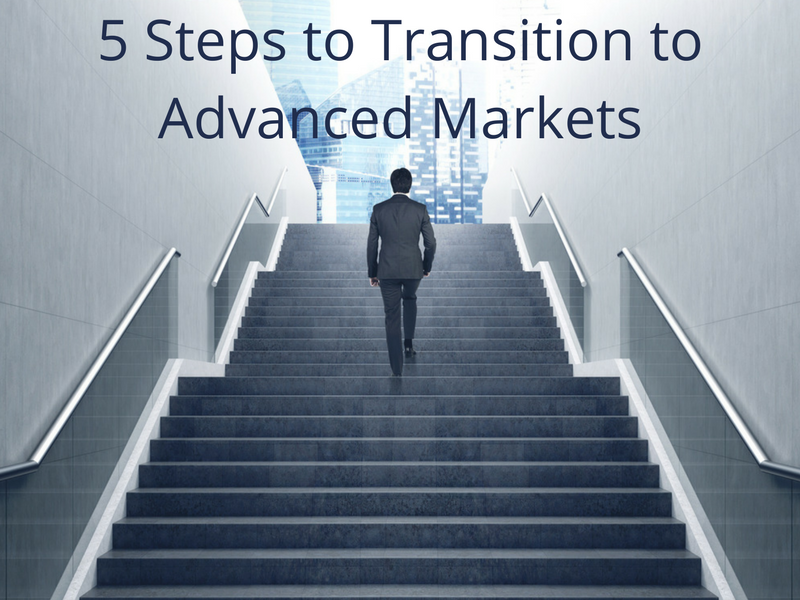 We've identified five steps to take when making the transition into advanced markets. Advanced in itself means developed, so when working with these high level cases like; high-net worth individuals and business owners, there are multiple financial and tax options to consider. This may mean that multiple concepts are needed to provide solutions to different problems. How do you figure out the best methods to use? Expanding your way of thinking is key. Become an expert in the industry by attaining CLU (Chartered Life Underwriter) and ChFC (Chartered Financial Consultant) designations. These professional educational programs will help you more thoroughly understand the intricacies of executive compensation, business succession planning, qualified plans and estate planning. Also, having these designations will present you from the start as an authority in your field to clients. When working in advanced markets you're clients advisors will likely consist of lawyers, accountants and other highly experienced individuals. In order to present your solutions and overcome objections you'll have to be able to communicate confidently. To gain real-world experience and first hand expertise, it may be necessary to find a mentor. The value in learning from someone who has already perfected their skills is critical to building your business. With the average age of advisors at 50.9 and 43% over the age of 55, nearly one-third of advisors fall into the 55 to 65 age range, reports Cerulli. This stat translates that almost half of advisors are approaching retirement and will need someone to take over management of their book of business. Not only could you benefit from learning from an authority, you quite possibly could gain potential clients from a partnership or apprenticeship. This education outside of the classroom or online training is as consequential as staying knowledgeable of industry trends, products and changes. To establish the best course of action for your clients, it's best to consult with carriers directly. Carrier advanced sales experts are able to use their multitude of resources to put together advanced marketing concepts in a more presentable manner that will be easier for your clients to understand. By working with carrier experts you'll have access to advanced planning attorneys and product specialists to help you decipher the best solutions. They may even provide direction and actions that you wouldn't have thought of. Bryan Pritchard writes How to Move On Up to the Advanced Market in InsuranceNewsNet, "they can help you turn technical information into action-oriented solutions for your clients, and in turn help you advance your business." Unlike smaller cases, these complex cases often need to be reviewed by multiple advisors and approved by business partners. This can take time, but will be worth the wait. Be patient and stay organized so you don't miss important dates or deadlines. The best way to grow your business is through referrals. When working with business owners and clientele who have an array of business connections your chance of referrals increases. If you're working with your clients on multiple planning approaches you have more opportunities to form meaningful customer relationships with them. The more trust your client feels, the more they will recommend your services. We want to hear from you! Tell us how you broke into Advanced Markets?